Dr. Parul Pujary completed her Masters in ENT in 1997 from KMC Manipal. Prior to this, she worked as junior resident in 1993-1994 in Ophthalmology. Besides ENT, she did post-doctoral fellow in Plastic Surgery from 1998-2000 in KMC Hospital. She has worked for 10 years in teaching institute and was involved in Cochlear implant research project at Addenbrooke's Hospital, Cambridge, UK. 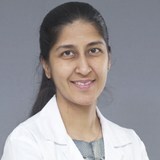 Dr. Parul has over 20 national and international publications to her credit. She has attended several courses and workshops, nationally & internationally which has broadened her knowledge and expertise in FESS and head & neck surgeries. Dr. Parul is the Life member of the association of Otolaryngologists of India (AOI) & Member of Karnataka Medical council. Now she practices basic ENT surgeries that also include Sino-nasal surgeries, Microlaryngoscopy, ear lobe repair, ENT post-traumatic cases. She has over 15 years of professional experience.